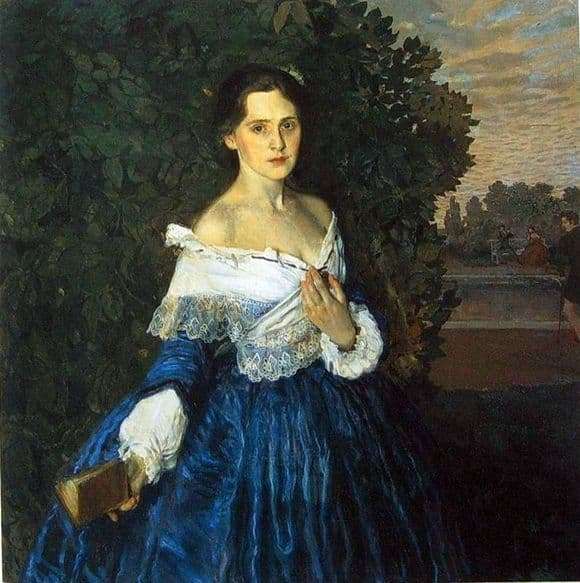 In the painting “Lady in Blue” Konstantin Andreevich Somov portrayed his close friend and craft colleague – the artist Yevgeny Martynov. The artist created a retrospective portrait by placing his model in a stylized park and dressing her in an old luxurious dress. Some researchers believe that in this portrait Somov portrayed the Beautiful Lady of the mythical Silver Age, a certain sublime image of an ideal woman who, alas, cannot be found just walking along the street. It seems that this is an ordinary formal portrait – a beautiful young woman in an expensive vintage dress, with a volume of poetry in her hands, stands against the background of the trees of the park. But when looking at this work, we see not just a beautiful picture, we feel the sadness of the heroine of the portrait, penetrating sympathy for a pale, painful angel who has flown into this sinful land. The composition of the painting is impeccable built – the slender female silhouette is almost perfectly fit into the frame of the canvas, the blue luxurious dress with lace emphasizes the fragility and spirituality of the heroine’s face. From the heavy expensive fabrics of the lady’s dress, bluish shadows fall on her pale, sad face. The dark green of the bushes behind the woman as if separates her from the rest of the world. All the colors of this old park, memories as if faded and withered. In the background of the picture one can see a lake on the shore of which musicians play. That is, there seems to be an ordinary life, but this background looks like an old faded photograph, a snapshot of a bygone reality. The lady alone is not part of this old photo, it is real, as the angel can be real in the human form. At the bottom of her big sad eyes – the suffering and pain. In all her appearance felt tired and broken. When looking at it, the viewer becomes imbued with the nagging longing that the artist himself experienced while painting this portrait.